They may not be the savage nightmares depicted in Hollywood films, but Scolopendra gigantea are pretty impressive agents of make-your-skin-crawl scary. Commonly known as Amazonian giant centipedes or Peruvian giant yellow-leg centipedes, at 10 to 12 inches long and equipped with dozens of swift and agile legs, they're the largest members of the Scolopendridae family. Amazonian giant centipedes are predominantly found in the tropical and subtropical rainforests of western and northern South America. They also inhabit areas of the Caribbean, including Jamaica, the U.S. Virgin Islands, St. Thomas, St. Martin, Grenada, Trinidad and Tobago, and Seychelles, Puerto Rico. Since their cuticle has no protective waxy covering, they seek out humid environments, inhabiting moist soil, rotten wood and leaf litter. Scolopendra gigantea have flat, distinctly segmented, reddish-brown bodies. They have from 42 to 46 pale yellow legs. Their back legs are spiny to deter predators. They are equipped with venom-filled appendages called maxillipeds, located on their first body segment, and mandibles, located on their heads. These appendages are used to seize and subdue prey. The giant centipede's head is covered by a flat shield from which long, jointed antennae protrude. Their vision is limited, so they rely on touch and chemoreceptors to navigate. As might be expected, giant centipedes have ravenous appetites. They are skilled, aggressive hunters and will eat whatever they can catch, including insects, worms, snails, frogs, lizards, snakes, birds and mice. According to Animal Planet, these colossal arthropods are known to climb cave walls, hang by two legs from the ceiling and catch bats in mid-flight. They subdue their prey with the toxins in their maxillipeds and mandibles, then cut into their meal and consume it. 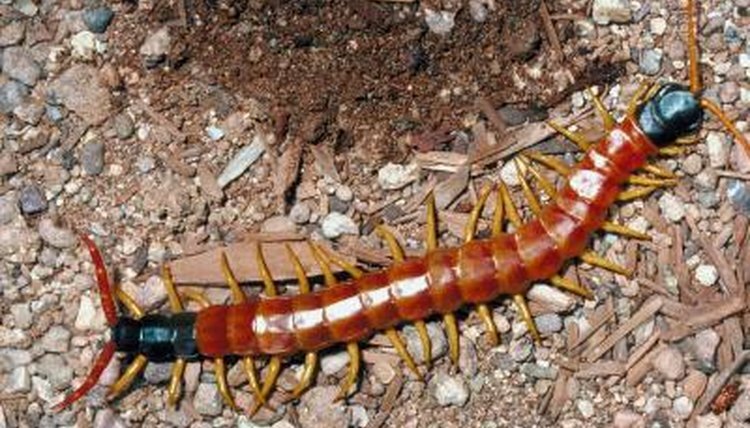 Scolopendra gigantea engage in external fertilization. The male centipede has no copulatory organs, so he spins a small silken pad called a spermatophore and deposits his sperm on it. The female collects the sperm, fertilizes her own eggs and buries them in moist soil. She protects her eggs, cleans them to keep them free of fungus, and cares for her hatchlings until they are able to hunt for their own food. Amazonian giant centipedes are an important part of the ecosystem. Their consumption of insects and other invasive animals is valuable to farmers and gardeners. On the flip side, they are not above biting a human if cornered. According to Animal Planet, their bites have been equated to a gunshot wound or broken bone. Although their venom is not typically lethal to humans, it can cause swelling, intense pain, chills, weakness, fever and, in people allergic to bees, anaphylactic shock. What Are the Prey or Predators of a Red Kangaroo?